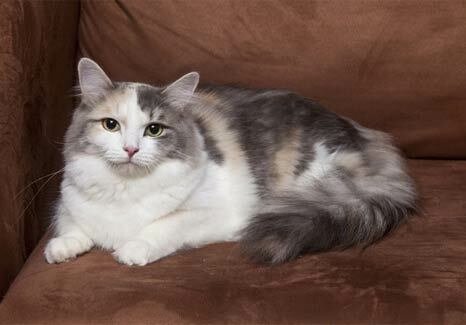 RagaMuffin cat breed information and advice. Ragamuffins are incredibly docile! A relatively new breed both here and in the US, the RagaMuffin has inherited much of its relative the Ragdoll cat breed's best qualities - and then some - as they also love to be picked up and carried around, but are said to have more 'get up and go' than their relaxed cousins. John Cann, chairman of the UK RagaMuffin Cat Society, says: "RagaMuffins have the genetic potential to be very loving, sweet-tempered and intelligent. They love to cuddle and play, and are able to adjust easily but without giving up their personality. RagaMuffins are great companions - no matter if you are single or living in a big family - and will reward all your affection and attention. They attract and fascinate people for many reasons, from their size and sweet expression to their soft, plush semi-longhair coat." As well as their beauty, RagaMuffins also have the brains as they are adept at playing games of fetch and can be trained to walk on a lead. Their laid-back personality means they are good with children and make a good family pet. RagaMuffins are large, muscular cats with a rectangular body, broad chest and powerful shoulders supporting a short neck, broad head and an adorable fluffy tail. These semi-longhaired cats have a dense, thick and plush coat, which John describes as like that of a heavily-furred rabbit, with an adorable ruff around the neck and knickerbockers (dense fur) on the hind legs.John says: "Structurally, the RagaMuffin differs to the Ragdoll as the nose is shorter and the eyes are walnut-shaped rather than the Ragdoll's oval. Where the Ragdoll profile is a gentle curve, the RagaMuffin should have an obvious nose dip or scoop." RagaMuffins comes in a rainbow of colours and coat patterns that include seal, chocolate, blue, lilac, black, red, silver, shaded, smoke, cameo, cream and tortie in colourpoint, solid, mink, sepia and tabby patterns. Their large eyes may be blue, green, gold, amber or aqua. Despite his grand, fluffy appearance the RagaMuffin has a soft, plush coat which is easily cared for with a few minutes of brushing or combing twice a week, plus a weekly ear clean. Generally speaking, RagaMuffins are said to be healthy cats with no known inherited diseases, but be sure to check with your breeder that their cats have been tested for Hypertrophic cardiomyopathy (HCM) and Polycystic kidney disease (PKD). Also, as these cats are quite large and well-built, you'll need to feed them a healthy, well-balanced diet and ensure they get plenty of exercise as they could become overweight quite easily. Only buy your kitten from a reputable breeder, and look for kittens that are bright-eyed and lively with wet little noses and no discharge coming from the ears, eyes or nose. As there are relatively few RagaMuffin breeders in the UK, you might have to wait a while for a kitten, especially if you want a particular colour, and be prepared to travel. The history of the RagaMuffin can be traced back to the founder of the Ragdoll cat breed, Ann Baker, who created the breed in California in the 1960s. Breeders who had been working with Ann on the Ragdolls decided to create their own breed, the RagaMuffin, in 1994. Efforts to import RagaMuffins to the UK began in 2008 by experienced Ragdoll breeders, and the breed started to arrive in the UK in 2009, receiving GCCF preliminary recognition in June 2010.